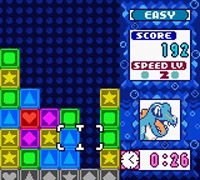 A version of the Puzzle League series, starring Pokémon from the Gold & Silver games. Colored blocks rise from the bottom of the screen and you must flip them horizontally using the cursor to line up three or more of the same color to clear them. The blocks above will drop down, allowing you to set up combos. The game includes a Story mode, where you unlock characters as you progress; a Puzzle mode, where you have to clear a static block formation within a limited number of switches; as well as a multiplayer mode.